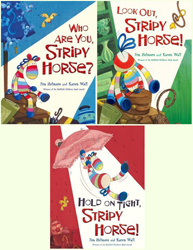 Hold On Tight Stripy Horse! 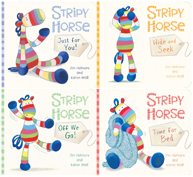 Our new Stripy Horse picture book is almost out! 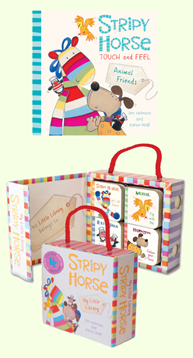 We’ll be visiting a couple of lovely independent bookshops in the next few weeks for storytimes and drawing fun. Do come along – we’d love to see you! We have this book for at least 3 months now and still read it at least twice a day. My son who is nearly one loves it so much that I have to hide it because if it was up to him we would read it all day long! 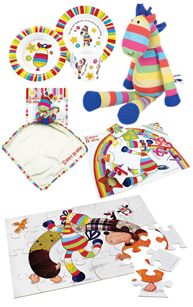 Hi I’m a student teacher and I’ve been using this book for music and science teaching with the Primary 1 class. They totally love it, and we designed boats to help keep Stripy Horse safe today. Great book – thanks! So glad that you’re all enjoying the story. The boats sound wonderful- we’d love to put some pictures on our blog. Do send them through using the contact form on our website if you can!